Last week I was in Houston for Fall Quilt Market. And somehow the warm weather and humidity was fooling me into thinking that fall was far away- mostly because I don't ever remember wearing my sandals in October before. All I had to do was get off the plane in Bozeman to remember what cold feet felt like.... And the truth hit- It's fall but winter is not far. I can finally bring myself to admit it since rain and snow is in our forecast for the next few days. This means it's time to buckle down and REALLY focus on those Christmas gifts. And we've got lots of ways to help! From Market, I brought back wool, kits, new and interesting patterns, new purses and patterns, as well as great fabrics. I found an exciting program for January with English Paper Piecing. Don't let that scare you- I've already started on my project and it's a blast! I will show you more in next month's newsletter. If you are following us on Facebook- you've already had a sneak peak! We are starting the 12 Days of Christmas on Dec 1st. I picked up some great gift ideas at Market that we are saving for 12 Days specials. See more info below. 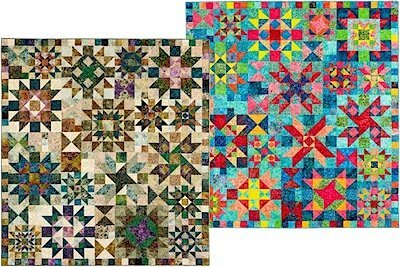 Don't forget to check out our classes, clubs, events and sales coming up to get you in the spirit of the Quilting Season. Reminder: For those ladies who are participating in our Mini Charm Challenge- entries are due on Nov. 9 (next Monday). We will be voting from Nov 10-Dec 5th. People's choice first and second place winners will be contacted via phone on Dec 7th. If you are in the area, stop in and see what these creative ladies have made!! Vote for Pedro- I mean, Vote for your favorite! Downtown Bozeman Christmas Stroll- December 5th- We will be open from 10 am - 7pm. 12 Days of Christmas- Check out our One Day Only daily special- we will have them posted on our Facebook page starting December 1-14 (skipping Sundays- my hubby says I need one day off a week!) Specials will be listed daily and available starting 10 am - 11 pm each day. You may purchase the special by coming into the store, calling us directly (406-586-6097) or by placing your order online. Like us on Facebook to be connected! Birthday Club: New Session starting in January 2016- Sign up today for your birthday month. We have had a fun time this year making one block a month for each other. Don't miss out!! 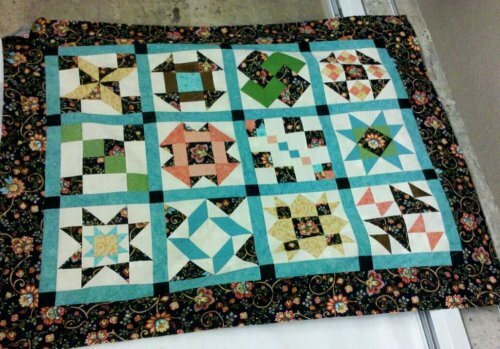 Beginning Quilting Class- A great refresher if you've been quilting for a while or if you are new to quilting and desire to learn the basics. 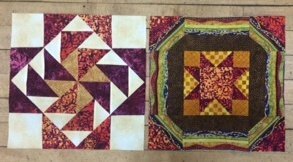 We teach formulas for figuring out all kinds of quilting blocks. The Spring 2016 BQ Session starts on Tuesday, February 9th- runs for 12 weeks. Fearless Embroidery & Software Inspirations - For October and November's classes, we are combining the last sessions of these classes. Come and learn all about Embroidery and Software on November 6th. We will start with Fearless Embroidery @ 10 am- 12 and Software from 1pm - 3pm. This will be our last session for the year. Come and find out where we are going in 2016. F.W.Y.S. Club (FINISH WHAT YOU STARTED)- On Fridays each month we have staff available in our classroom to help you finish those projects that have been hanging over your head. Call ahead and let us know you are coming as space is limited and machines are spoken for quickly. Cost: $10 for classroom use and an extra $5 if you need to use our machine. 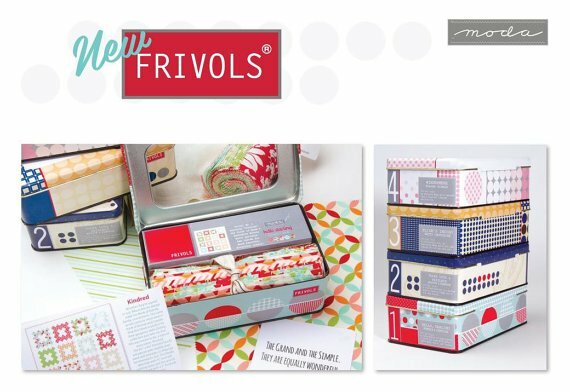 Frivolous Friday Club - Frivols are collectors tins of a collection of cotton fabric complete with a pattern. 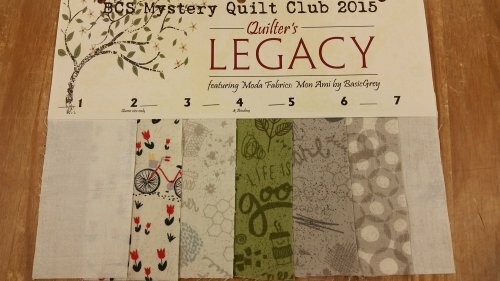 Be sure to join us on the second Friday of each month with your set and pattern to participate in our Frivolous Friday Club. Both the Frivols and the club will only last for six short months! 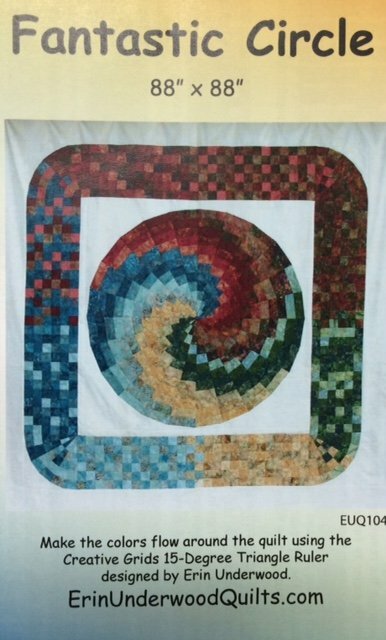 T- Shirt Quilt Class- We've been asked to have this class again. I will need at least 5 people to hold the class. Please call the store and get on the interest list so we can plan this out. Coming in January - we are working on our store samples and cannot wait for you to see these gorgeous batiks! $31.50/month with $30 registration fee due at sign up. Please let us know as space is limited in each colorway. Purebred- by Moda- Kits, Pre-cuts and Yardage available. Little House on the Prairie- November delivery! We've got new minkee kits coming from Shannon Fabrics, new patterns from Pink Sand Beach (they know how to make a great purse! ).